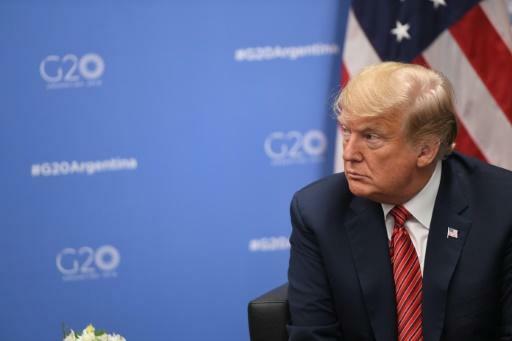 Strains over climate change marked the end of the G20 summit in Argentina Saturday as the United States celebrated what it called a victory for its holdout stance. A paragraph in the statement noted: "The United States reiterates its decision to withdraw from the Paris Agreement." Beyond entrenching their position, US officials said they saw growing dissent, even if the communique still resulted in a 19 versus 1 declaration backing the Paris climate pact. The "coalition" against the United States on climate change was beginning to fray, a senior White House official said, adding that several countries, including Turkey, Russia and Saudi Arabia, had balked at signing the document before finally backing it. "We had a paragraph where we specifically preserved and explained our position for why we're withdrawing from the job-killing Paris Agreement," the official said on condition of anonymity, repeating President Donald Trump's denunciations of the accord as bad for US business interests. "I think across the board it was really a resounding success." Outside the United States, which joined the Paris deal under former president Barack Obama, the biggest polluter not to have ratified the 2015 Paris Agreement is Russia, which ranks fifth. Turkey and Iran have also failed to ratify. A French source close to the negotiations said earlier that "a certain number of countries" were hesitating "to confirm their commitment to the Paris accord, so it was one of the big battles of the night to keep the pack of 19." The feud comes despite mounting signs of the impact of climate change, with a major US government report last week saying that the country's economy could be sliced by 10 percent by the end of the century without major action. Thomas Bernes, senior fellow at the Centre for International Governance Innovation in Canada and a former G20 negotiator, also said that objections from Turkey and the Saudis had contributed to holding up the final communique. The statement stressed the need to respect different paces of economic development, as developing economies balk at going further on their Paris pledges. "But in the end, it's still 19 v 1," said Bernes. He said Brazilian far-right president-elect Jair Bolsonaro, who takes office on January 1, would be unlikely to help G20 consensus on climate. Bolsonaro has threatened to follow Trump's example and withdraw his country from the Paris Agreement. The differences laid bare in Buenos Aires came a day before UN climate talks were to get underway on the other side of the world in the Polish city of Katowice. The COP24 is seeking to breathe new life into the pact, in which nations agreed to hold global warming to "well below" two degrees Celsius (3.6 degrees Fahrenheit) over pre-Industrial Revolution levels, and to strive for a lower limit of 1.5C, if possible. 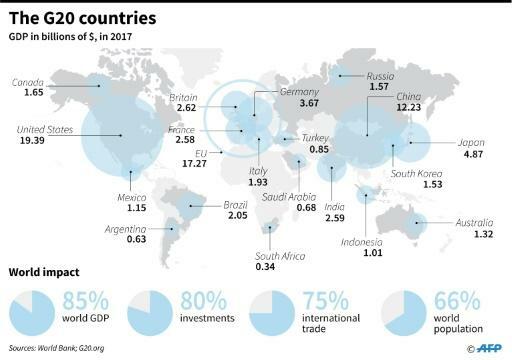 G20 leaders meeting in Argentina from November 30 to December 1 and a world map of the member countries.